The field of demography has evolved significantly since the 1950s. The first compendium of the discipline of demography was the landmark volume, The Study of Population: An Inventory and Appraisal, by Philip M. Hauser and Otis Dudley Duncan, first published in 1959. The Study of Population is a useful benchmark for gauging the nature and extent of change in the field of demography in the six decades since its publication. The chapters contained in that volume were grouped into four sections. Part I, Demography as a Science, contained four chapters laying out the substantive, methodological, epistemological, and organizational foundations of the discipline (Hauser and Duncan 1959a, b, c, d). Part II, Development and Current Status of Demography, offered eight chapters portraying the origins and practice of demography in selected nations, along with an insightful overview of disciplinary history (Lorimer 1959). Part III, Elements of Demography, included a dozen chapters covering the demographic equation, the structure and components of change, as well as assessments of demographic data. Finally, Part IV, Population Studies in Various Disciplines, contained seven chapters discussing common interests of demography and selected disciplines, including sociology (Moore 1959), economics (Spengler 1959), and human ecology (Duncan 1959). 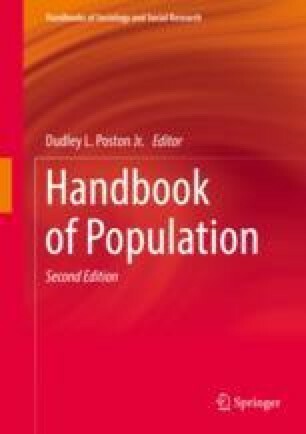 In 2004, Michael Micklin and I wrote a Prologue to the 1st edition of the Handbook of Population that was then published in 2005. When I began putting together this 2nd edition of the Handbook in the Spring of 2017, Mike started in the latter months of the year to begin updating and revising the Prologue. But then he passed away in February of 2018, having just begun his revision. He was very ill the last few months of his life, but he did his best to work on the revision. I have used the changes that he introduced, in my rewriting of the Prologue, and I have retained Mike as a coauthor. A lot of him remains in this important statement about the progress of demography. Michael will certainly be missed. He was a true friend and a superb demographer and human ecologist.